My application has a built-in self update system via another app called "updater.exe" which is in the same folder with the main application to update. It downloads the newest version, terminates the old one (if it's running) and then overwrites it. Just because my application uses My.Settings object, it loses all the stored settings when it run as admin because typically it always start as normal user and as you may know, My.Settings is user-sensivite object. How can I fix such an issue? I've searched around but could not find anything related to "Run as normal user" but always running as admin, which is quite easy. Well, honestly, in the other hand, I don't think such a thing could be possible because the updater app cannot know which specific user has started it. Or can it? Is there something I'm missing here ? If I am right, it is the only option to NOT to use My.Settings but the Windows Registry to store user preferences? Its better to think of this as starting the app with default rights. If running elevated Explorer will start the new instance elevated, but original first Main App instance would also have run elevated. proc.StartInfo.Verb = ""                ' important! The label at the top of the form indicates whether that app is running elevated, each app instance was started by the one before it. The second window down is running elevated. When it started the next instance, the check box for As Admin wasn't checked; as a result the 3rd instance was started via Explorer and is not running elevated. Same for #4 starting #5. Not the answer you're looking for? Browse other questions tagged vb.net uac privileges runas my.settings or ask your own question. 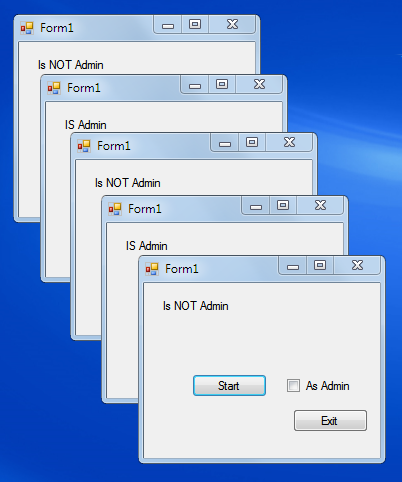 How to start a new process without administrator privileges from a process with administrator privileges?